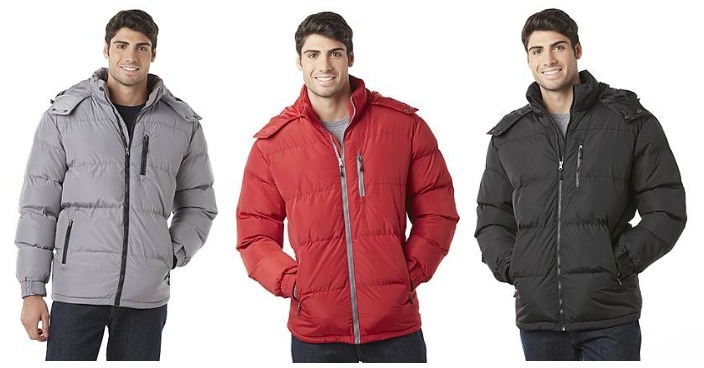 Men’s Hooded Puffer Jackets Only $15.99! Down From $80! You are here: Home / Great Deals / Christmas Deals / Men’s Hooded Puffer Jackets Only $15.99! Down From $80! Sears has these Men’s Hooded Puffer Jackets on sale for $15.99 (Reg. $80)! Plus you can get FREE in-store pickup or FREE in-store pickup on orders over $49! Prepare for the worst winter has to offer with this men’s hooded puffer jacket from Outdoor Life. Lined and filled for heat retention, this heavyweight bubble coat traps body heat while its quilted shell and stand collar repel bitter breezes. The attached hood features a snap closure that provides extra coverage and protection. Icy drafts won’t threaten your warmth thanks to elastic cuffs and a drawstring hem. Final: $15.99 PLUS FREE in-store pickup or FREE in-store pickup on orders over $49! !